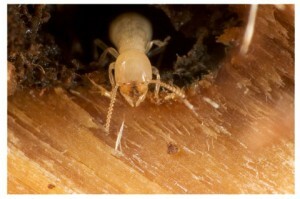 A termite’s species determines its location in the world. And within that world location each individual species has a common habitat, though it might take on a different shape or form. Some examples of specific nests are: the Drywood termite lives in dry wood, and subterranean termites live underground or in damp areas above ground. Usually nests are built underground or often found in larger pieces of fallen trees. Both of these options provide termites to go undetected by remaining “invisible.” This is why they are able to cause large amounts of damage in seemingly short amounts of time. By the time you have noticed termite damage signs it is usually too late. While termites usually build hidden nests, some species have been known to build nests above ground – the nests essentially become mounds – these mounds can grow up to 9 meters tall! Because the nests are usually hidden, it’s hard to imagine just how dense a termite population can be – within just one square meter of a mound there can be tens of thousands of termites. Each termite species builds a different mound shape. Some termite species actually build mounds that have elaborate sculptured forms. Need help in Scottsdale? Visit Scottsdale Termite Control. Previous postTermites Helping the Worldwide Ecosystem Next postAre Termites Getting You Down?